Justice is swift and blind, it seems. Gilbert Arenas plead guilty to a felony charge of gun possession this afternoon in Court, and faces up to five years in prison and the invalidation of his contract with the Wizards and the NBA. In reality, it’s more likely that Arenas would receive no more than 6 months in jail, a hefty fine, and probation. I guess that joke wasn’t very funny after all. Then again, neither are the Wizards. 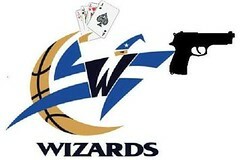 Just imagine all the jokes that would be going on if they were still the Bullets and not the Wizards.